Oconto, Wisc.—August 4, 2018— A day-two midday flurry propelled Wisconsin’s Ryan Dempsey and Jake Kaprelian to the top of the leaderboard in a big-fish shootout at the Cabela’s Masters Walleye Circuit tournament on Green Bay of Lake Michigan out of Oconto, Wisconsin, August 3-4, 2018. Presented by Mercury Marine and headquartered at Breakwater Park, the two-day event featured 84 two-person teams from 12 states. Dempsey and Kaprelian brought in a 5-fish MWC limit weighing 32 pounds, 9 ounces on day one. The weight put them solidly in fourth place. 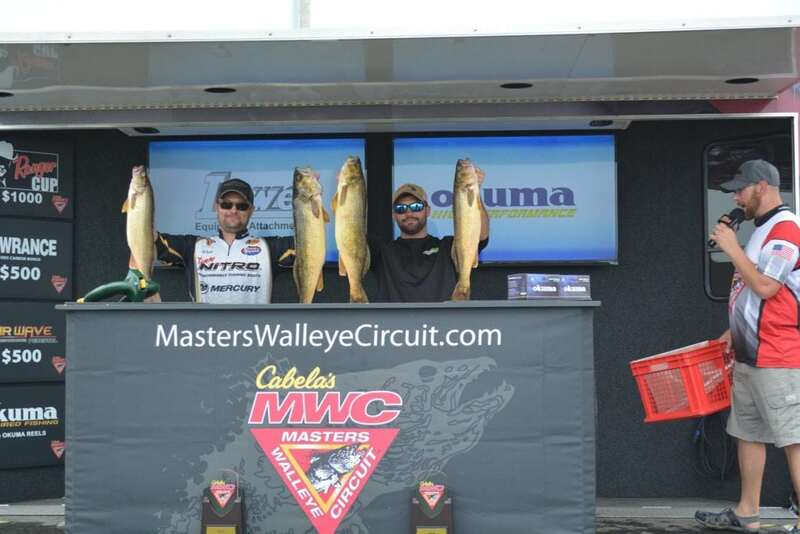 They added a 38-pound, 14-ounce limit on day two for a 71-pound, 7-ounce tournament total. They reported trolling spinner rigs and crawlers on day one, and catching most of their day-two fish on banana-style crankbaits. Shallow structure rising out of deep water was key both days. Dempsey and Kaprelian collected $16,822 in cash and prizes for their efforts, including the $11,500 first-place cash payout, $3,822 cash from the option pot, $500 Lowrance Electronics bonus, $500 AirWave certificate, and a $1,000 Cabela’s National Team Championship Prize Package including paid entry into the Cabela’s NTC, travel stipend, team jerseys and plaques. Sixth-place finishers Daniel Woodke and Steve Meyer won $2,000 cash plus the $1,000 Ranger Cup contingency and $1,250 from the option pot. In all, the Cabela’s MWC awarded $62,752 in cash and prizes at the event. A total of 692 walleyes weighing 3,146 pounds, 2 ounces crossed the scale during the tournament. Big fish was an 11-pound, 6-ounce trophy caught by Jason Merkley and Dustin Kjelden. Adding to the fun, the Cabela’s MWC and National Professional Anglers Association presented a Youth & Family Fishing Clinic immediately after the day-one weigh-in, with participating youths receiving rod-and-reel combos courtesy of the NPAA.